Key Difference: C++ is an object oriented language that mainly focuses on objects. 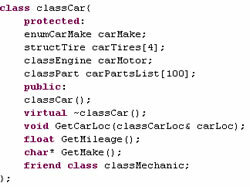 A class in C++ can be defined as a collection of related variables and functions encapsulated in a single structure. Instances of the class are termed as objects. A structure in C++ can be referred to as an user defined data type possessing its own operations. Unlike in the C language, they both are quite similar in C++. The main difference that exists between them is regarding the access modifier; the members of a class are private by default, whereas members of a struct are public by default. A class in C++ is just an extension of a structure used in the C language. It is a user defined data type. It actually binds the data and its related functions in one unit. A structure and a class in C language differs a lot as a structure has limited functionality and features as compared to a class. On the other hand, structure and class in C++ are quite similar. The main difference arises due to the fact that by default, all the members of a class are private, whereas by default all the members of a structure are public. Structure is also a user defined data type with a certain template. It is generally used for grouping of logically related data items. After the creation of a structure, the variables pertaining to the type of structure can be defined and used. A structure is used to represent a record. In C++, a structure can have both data members and functions as classes. Many people find it difficult to differenciate between a class and a structure. Technically they both are regarded as the same in C++. A class in C++ can be defined as a collection of related variables and functions encapsulated in a single structure. A structure can be referred to as a user defined data type possessing its own operations. Generally used for large amounts of data. Generally used for smaller amounts of data.